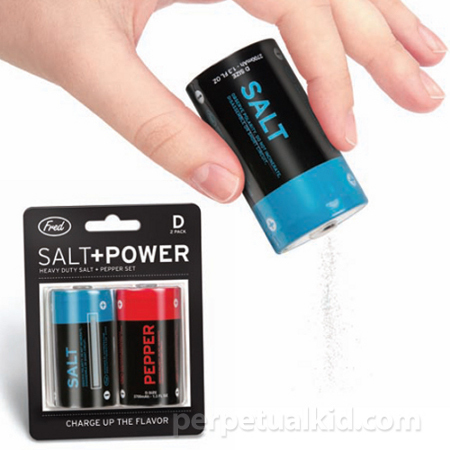 You can literally “power up” your meals with the Salt & Pepper Power Battery Shakers – these will come in interesting D battery replicas, and they’re not poisonous in any way whenever it comes into contact with your food. Definitely the way to amplify the taste of your spread, and whenever they run out of flavor power, you need not buy a new set for $11.99 – no sir, all you need to do is just refill them and you (and your tastebuds) are good to go! To know just what the remaining level of salt and pepper are left inside the respective shakers, there is a transparent strip on the side to indicate the amount of “power”. One thing’s for sure – while it might not be able to provide juice for your electrical items, “recharging” this will happen many, many more times in your lifetime than your Eneloop batteries are able to provide. Definitely the perfect gift for the geek at home (and in the kitchen).